Sally Wheeler-Maier and Captain Courageous PA accept Silver Champion from Cynthia Richardson. Photos by Emma Maxwell. New York, NY – Horses returned to New York City’s Central Park for the second-annual Rolex Central Park Horse Show on Wednesday with the inaugural U.S. Open Arabians, presented by Aljassimya Farm. Showcasing the athleticism and diversity of the Arabian breed in the foreground of the Manhattan skyline, Champions in four under saddle and six halter classes were crowned. Classes including Hunter Pleasure, Western Pleasure, and Country English Pleasure showcased the Arabian horse under saddle. Yearling Fillies, Yearling Colts, Junior Fillies 2-3 Years Old, Junior Colts 2-3 Years Old, Senior Mares and Senior Stallions were presented in hand to highlight these horses as desirable breeding stock based on their conformation and shape. Capping the evening, Arabian fans at Wollman Rink traveled through time to when Arabian horses roamed the desert. The Arabian Mounted Native Costume class portrayed the magic and romance of the Arabian horse as ancestors of modern day light breeds. Gold, Silver and Bronze Champions were awarded for each of the ten classes offered at the Rolex Central Park Horse Show where Sally Wheeler-Maier, a New York City native, was presented as Silver Champion in the Country English Pleasure class aboard her own Captain Courageous PA. Wheeler-Maier is an amateur rider who makes a living as an actress and rides part-time. “Usually you travel all over the country to show, but I walked ten blocks from 66th and 2nd carrying my show hat and I had a lot of family and friends here cheering me on, which was an amazing feeling,” she said. Wheeler-Maier has been showing since she was nine years old, after reading The Black Stallion and asking her dad for a black Arabian stallion. She received just that and has since been dedicated to the breed through her training at Trowbridge Arabians in Westport, CT and at shows from coast to coast, a list that now includes New York City. “It’s like a really fantastic fancy horse camp,” said Wheeler-Maier of competing in Central Park alongside professionals. One professional that competed in five of Wednesday’s classes and earned two Gold, one Silver and two Bronze Championships was Ted Carson. Carson hails from Minnesota, but now calls North Carolina home and competes all over the world. Richardson and International Equestrian Group CEO Mark Bellissimo were proud to announce that the U.S. Open Arabians will return to headline the 2016 Rolex Central Park Horse Show and anticipate a huge response from the Arabian horse community. Full results from the U.S. Open Arabians are available here. The Rolex Central Park Horse Show continues through Sunday, September 27, with more multi-discipline equestrian sport. In addition to Arabians, the schedule includes the inaugural U.S. Open in the following categories: Jumpers, Dressage, Hunters, and U25 Jumpers. All classes will be streamed live at www.centralparkhorseshow.com. Aljassimya Farm is committed to the Arabian horse. Not only by linking the history of this timeless horse to his future, by breeding our own elite generations; but by sharing the magic of the breed with new audiences. 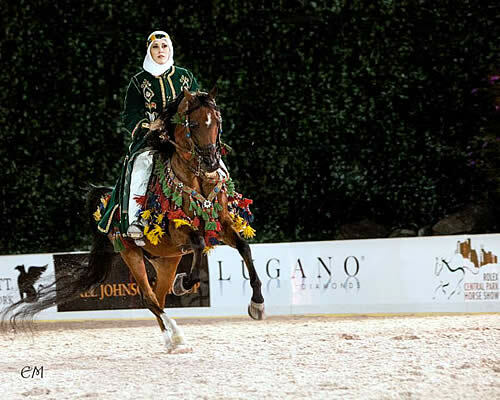 It is a proud moment to be part of the Rolex Central Park Horse Show, bringing the Arabian Horse to the heart of New York City for the first time. 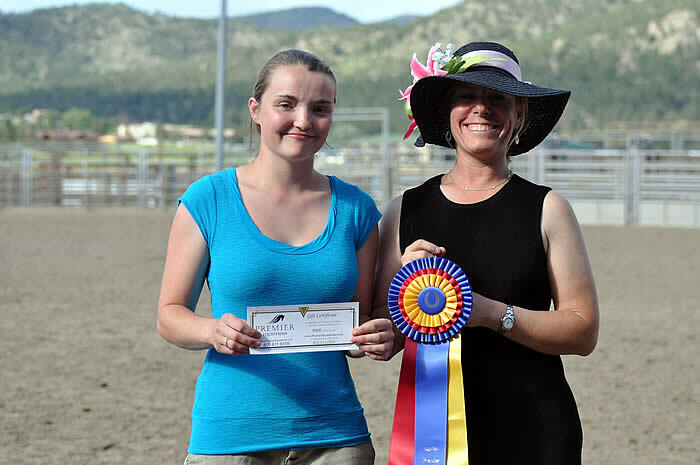 Sandy, UT (August 18, 2011) – With a combination of a warm smile, encouraging comments, a humble attitude, and a striking amount of horsemanship, eighteen-year-old Kara Wintersteen won over the judges and earned herself the Premier Equestrian Sportsmanship Award at the Estes Park Arabian Horse Show. She and BB Princess Liyah, a nine-year-old Arabian mare, competed in a variety of classes and whether she missed a class or missed a lead, Wintersteen was never heard to complain, and always gave her horse credit for her winnings. After having to scratch her morning dressage test due to a delay on the trail course, Wintersteen was given the chance to ride the test at the end of the schedule, just before the halter class was scheduled to begin. She rode a beautiful dressage test before high tailing it out of the gate to strip off her tack for just in time for the halter class. Michael Byatt with World and U.S. National Champion Stallion Dakharo (USEF Archives). Thank you USEF Facebook fans for these questions for Arabian trainer Michael Byatt. For the next “10 Questions With…” visit www.facebook.com/USEquestrian. 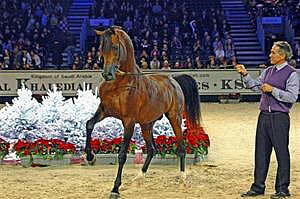 Next to be featured is dressage superstar Guenter Seidel. Mallory Krumm of Nicholasville, KY: What made you want to show horses? As a child, I loved doing anything that involved horses. One aspect of that was attending horse shows, which, in turn, made me want to participate and compete in horse shows. At the point that I began, it really made no difference what the competition was, be it egg and spoon, or park. I just wanted to be there. I believe to answer your question fairly it would be, I just wanted to be there – to be at horse shows – to be with horses. Heather Heineman of Middletown, Ohio: Why did you decide to work with the Arabian breed? It was an accident. Truly it could have been any horse, any breed. I love Arabian horses, but horses were my primary love. I had a neighbor (Ethel Ortenburger) that owned Arabians and she exposed me to the breed. Aurora, CO — The Arabian Horse Foundation has announced it received a $50,000 gift from the Barbara Wright Hutton Trust, the largest gift the non-profit entity has ever received since re-launching in 2007. The $50,000 gift was directed to horse rescue and rehoming and to equine research. Ms. Wright Hutton lived in St. Louis, MO, owned an Arabian and loved horses. Johnston describes her aunt as “a charitable person,” and recalls that her aunt, “truly enjoyed horses,” and was introduced to horses at various camps at an early age. Prior to Wright Hutton’s passing in 2008, she urged Johnston, the executor and a trustee of her Trust, to give to worthy animal charities. The 8th annual Arabian Horse Association Sport Horse National Show was held September 22-25th in Nampa, Idaho. KB Omega Fahim+++// and daughter KB Jull Fahim+//, swept the open FEI dressage division. This is the first time a father and daughter have dominated the entire open FEI dressage competition of this national championship show. Fourteen year old KB Omega Fahim+++// won Grand Prix and Intermediate 11, while eleven year old KB Jull Fahim+// captured Intermediate 1 and Prix St. Georges. People were on the edge of their seats for the final Grand Prix test to be performed on the last day of the championships. Omega, under his exceptional trainer and rider, Chelsey Sibley, completed this monumental task with grace and ease. During the evening’s special ceremony, both horses were presented and awarded as champions of each test. Jull also achieved the open FEI high point of the show. Approximately 400 horses displayed their athletic abilities at the Idaho Horse Park. The Sport Horse National Championship Show featured 90 classes in several divisions that included in hand, hunter, jumper, dressage and driving, to name a few. Horses from forty-one states and two Canadian provinces came to compete in this national event. The prominent dressage judges were Marlene Schneider, Brian Ross, Jacqueline Lindberg and Sandra Chohany. Sport Horse Nationals is the only single-breed sport horse event in the nation offered just for Arabian, Half-Arabian and Anglo-Arabian horses registered with the Arabian Horse Association or the Canadian Arabian Horse Registry. Arabian stallion KB Omega Fahim+++// is owned by breeder Elaine Kerrigan of Kerrigan Bloodstock in Eureka, CA and Half-Arabian KB Jull Fahim+// is owned by Chris Bailey, also of Eureka. Both horses are trained and shown by Chelsey Sibley of Sky Ranch, in Sonora, CA.